In a 13D filing today with the SEC, Berkshire Hathaway has disclosed its intention to acquire the remaining 19.9 percent of the shares of Wesco Financial Corporation that it does not already own. Wesco has been a majority controlled subsidiary of Berkshire Hathaway for over thirty years but shares continue to trade independently. 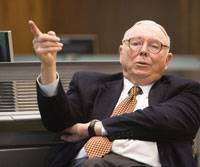 Charlie Munger serves as Chairman of Wesco and is also Vice Chairman of Berkshire Hathaway. The terms of the transaction call for acquiring the remaining shares of Wesco in exchange for Berkshire Hathaway Class B shares and/or cash valued at the book value per share of Wesco “as of a time reasonably contemporaneous with the closing of such transaction.” The deal would be structured to be tax-free to Wesco shareholders electing stock which could help secure the support of large Wesco shareholders such as Wesco Board Member Elizabeth Caspers Peters. Berkshire has indicated that the transaction will not proceed without majority support of the shares not presently controlled by Berkshire. For the last several years, Mr. Munger has stressed that Wesco Financial should not be viewed as an “equally-good-but-smaller version of Berkshire Hathaway”. Nevertheless, many investors who believe that Berkshire has grown too large to continue providing returns enjoyed over the past several decades (a self-evident mathematical reality) sometimes persist in attaching great expectations to Wesco. However, in recent months, Wesco has tended to trade at a slight discount to book value and this appears to have created an opening for Berkshire. Mr. Munger has stated that Wesco’s current status as a publicly traded company is more of a historical accident than any explicit desire for Berkshire to limit its ownership or a desire to see the shares trade. While Mr. Munger has said clearly that each dollar of book value at Wesco does not deliver as much intrinsic value as a dollar of book value at Berkshire Hathaway, by definition Mr. Munger must believe that Wesco’s intrinsic value is at least book value or he would be compelled to write down the value of goodwill assigned primarily to the CORT acquisition. Berkshire’s offer to pay book value for Wesco validates the company’s stance that CORT’s goodwill has not been permanently impaired. We can see that Wesco’s stock price approximated book value at the time of the Wesco annual meeting when Mr. Munger did not believe that an appropriate relationship existed between the valuation of Berkshire and Wesco stock. At that time, Berkshire traded at about 129 percent of book value. On August 25, the situation had changed with Wesco trading at 92 percent of book value and Berkshire trading at 133 percent of book value. While this difference does not appear to be dramatic, the fact that Wesco was trading at a slight discount to book value made it possible for Berkshire to offer shareholders a deal priced at book value representing a substantial premium to Wesco’s trading level on August 25. Berkshire could have obviously made a similar book value offer in May, but such an offer would not have been a premium to the then-prevailing price of Wesco and may not have been viewed as favorably by Wesco minority shareholders. Of course, book value is only one valuation metric and we know that it is an imperfect proxy for intrinsic value. Other factors may have changed over the past three months that led Berkshire management to act at this time. Why is Wesco Now Trading Above June 30 Book Value? After the 13D filing made the news today, Wesco stock immediately rose substantially with some trades taking place above $382, far in excess of June 30 book value. The terms of the proposal call for Berkshire to offer Wesco shareholders book value “as of a time reasonably contemporaneous with the closing of such transaction.” We know that book value was $352.66 on June 30, but has this changed over the past two months? Without insight into Wesco’s business results, we cannot be sure what book value might be today vs. June 30. However, we can draw some basic conclusions by looking at Berkshire Hathaway’s recent 13F filing with the SEC which lists equity positions held by Berkshire and its subsidiaries as of June 30. The exhibit below lists positions included in Berkshire’s 13F filing that are attributed to Wesco (codes 18, 19, and 20). Note that the total does not tie to Wesco’s total equity securities as of 6/30/2010 listed at fair value of $1,936,171,000 due to the presence of untraded securities such as Wesco’s share of the Goldman Sachs 10% perpetual preferred stock. Barring any major changes in Wesco’s portfolio of equity securities, which would be unusual based on the company’s long term investment strategy, it does not appear that the valuation of the publicly traded equity portfolio has changed very much since the end of the second quarter. Other factors such as strong business results could have boosted Wesco’s book value, but it seems speculative to think that book value has risen far above the level that was reported at June 30. If this is the case, speculators buying Wesco stock at a premium to June 30 book value may be disappointed with the final outcome if the transaction is consummated according to the terms proposed by Berkshire. Many Berkshire Hathaway shareholders have made an annual trip to Pasadena each year to attend Wesco’s annual meeting which offers a rare opportunity to listen to Charlie Munger for an extended amount of time. Those who have attended report that Mr. Munger offers far more personal opinions regarding the state of the economy and business than he typically offers at the Berkshire Hathaway annual meeting. If this transaction is completed, it is likely that Wesco’s 2010 meeting represented the end of an era — and a source of regret for those of us who never made it to a Wesco meeting in the past. In addition to the annual meeting, many Berkshire shareholders followed Wesco in order to gain more insight into CORT and other Wesco subsidiaries that do not receive much attention in Berkshire Hathaway’s financial reports. This detail will disappear in the event of Berkshire assuming full ownership. None of this is to say that Berkshire’s move to own all of Wesco doesn’t make sense, but obviously there will be less granularity for the small minority of Berkshire shareholders who care to delve into as many details as possible. Disclosure: The author of this article owns shares of Berkshire Hathaway. No direct position in Wesco Financial.